One of the questions asked by Bounder owners is "How accurate are my gauges?" This often leads to a follow-up question: "Should I add supplementary gauges?" For various reasons, the chassis manufacturers supply gauges that have scales showing a 'Normal' range rather than specific scales. They suggest that the production variation in sensors and gauge units combined with a wide variety of rig operating conditions justify their decision. Some owners may not be able to understand the information that a specific gauge scale provides, and bring their unit in for warranty repairs, when in the opinion of the manufacturer, the vehicle is operating within specifications. Accuracy of gauges, therefore is somewhat of an individual situation. I recommend getting to know your motorhome and the position of the needles on the scale within the 'normal' range. I have a 1994 Ford chassis equipped with Oil Pressure, Voltmeter and Water Temperature gauges, reading from left to right, top to bottom on the panel. A handy way that I utilize in scanning the gauges is the acronym MMO, which I remember as "MeM". What this means is that the Oil Pressure gauge needle usually sits over the 'M' in 'norMal', the Voltmeter gauge needle over the 'M' in 'norMal', and the Water Temperature gauge needle usually sits over the 'O' in 'nOrmal'. If the readings are different, I immediately run through possible reasons and decide whether the different reading is expected under the operating conditions or not. Watch your instruments to see how they change under various situations, and develop your own handy method of determining the "normal" readings. The addition of instruments is a personal decision, however I suggest supplementing the factory supplied gauges, before duplicating the instruments that you already have. 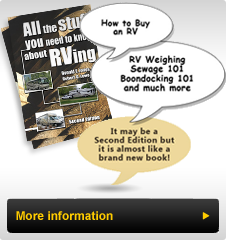 The instruments most motorhome owners have added are: 1) Tachometer, to determine the engine speed, allowing you to maximize pulling power when hill climbing; 2) Vacuum Gauge to assist in maximizing engine efficiency and save fuel; and 3) Transmission Temperature Gauge, to determine whether the transmission is operating within the optimum range without causing harm. Bounders built on late model Ford F53 chassis have a tachometer as standard equipment. The Ford 460 engine develops its maximum torque at 2,200 rpm while the Chevrolet 454 engine develops it at 1,600 rpm. Both achieve their rated (peak) horsepower at 3,600 rpm. The optimum situation is to be driven so that the engine is running at peak torque as much as possible, and in the power range between peak torque and peak power, under power demanding situations such as passing. In numbers this translates to operating at 1,600 rpm (Chev) or 2,200 rpm (Ford) to 3,600 rpm. A tachometer allows you to determine the engine speed and to select (manually, if necessary) the best gear to achieve the required power. As a rule of thumb the chassis manufacturers have attempted to gear their chassis so that at 55 mph (90 kmh) the engine is at, or close to, the engines peak torque while operating in overdrive. A Vacuum gauge, also known as a Fuel Economy gauge, shows the vacuum developed in the intake manifold of the engine, a measure of engine efficiency. The ideal is to travel at the highest indicated vacuum level, which will provide the optimum fuel economy. Combine this gauge with a tachometer and you will manage to keep the engine at its maximum torque and highest vacuum level, thereby making the best use of the power available and obtain the highest fuel economy under all road and wind conditions. As a practical matter, I have discovered that in certain wind and road conditions, the coach delivers better fuel economy in third gear rather than overdrive, by using the information supplied by these two additional gauges.